Submitted photo Honored for their commitment to honey bees, Greene County Parks & Trails (GCP&T) received the Greene County Beekeepers Association Outstanding Support Award at their March meeting. Current and past presidents Bill Starrett, GCP&T Chief Naturalist Cris Barnett, Mark Weaver, Dan O’Callaghan, Terry-Lieberman-Smith, Gene Glover and Dave Foubert presented the plaque. GCP&T has worked with the association for years in providing support and hosting educational events to the general public. For more information about GCP&T or honeybee programs, call 937-562-6440, email info@gcparkstrails.com or visit www.gcparkstrails.com. 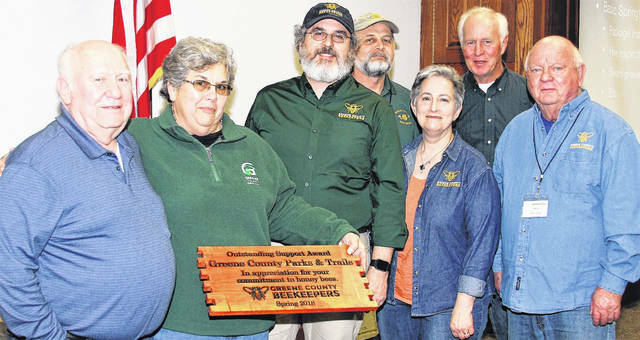 Honored for their commitment to honey bees, Greene County Parks & Trails (GCP&T) received the Greene County Beekeepers Association Outstanding Support Award at their March meeting. Current and past presidents Bill Starrett, GCP&T Chief Naturalist Cris Barnett, Mark Weaver, Dan O’Callaghan, Terry-Lieberman-Smith, Gene Glover and Dave Foubert presented the plaque. GCP&T has worked with the association for years in providing support and hosting educational events to the general public. For more information about GCP&T or honeybee programs, call 937-562-6440, email info@gcparkstrails.com or visit www.gcparkstrails.com. https://www.fairborndailyherald.com/wp-content/uploads/sites/50/2018/04/web1_pastpresidents.jpgSubmitted photo Honored for their commitment to honey bees, Greene County Parks & Trails (GCP&T) received the Greene County Beekeepers Association Outstanding Support Award at their March meeting. Current and past presidents Bill Starrett, GCP&T Chief Naturalist Cris Barnett, Mark Weaver, Dan O’Callaghan, Terry-Lieberman-Smith, Gene Glover and Dave Foubert presented the plaque. GCP&T has worked with the association for years in providing support and hosting educational events to the general public. For more information about GCP&T or honeybee programs, call 937-562-6440, email info@gcparkstrails.com or visit www.gcparkstrails.com.